Finance Costs > How Much Does a Lottery Ticket Cost? How Much Does a Lottery Ticket Cost? 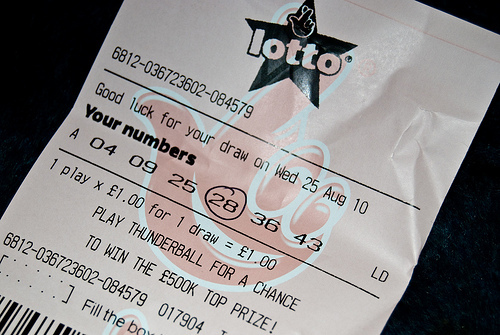 A lottery ticket is a form of gambling that is regulated by the states, and two of the most common lotteries known nationwide is the Mega Millions and Powerball. Lottery tickets will be priced differently depending on the type of lottery game you plan on playing and the state where the lottery is being held. The price of the ticket is not affected by how large the prize is, even if it reaches millions of dollars. Refer to our table below to see what each state may charge for its lottery game. On average, plan on spending anywhere from $1 per ticket for the Mega Millions to as much as $25 for a scratch-off ticket. The Powerball, for example, is $2 per ticket and the sales will be cut off 59 minutes before the drawing begins. However, if you were to use the optional “add-on feature,” which allows you to increase the original prize amounts, with the exception of the jackpot, then you will have to add another $1. If you were to match the five white balls only, then your prize would increase to $2,000,000 instead of the normal $1,000,000 prize. The Mega Millions, as mentioned, will cost $1 per ticket. State lottery tickets can often be purchased at local convenience stores, grocery stores or via a mass retailer. All state lotteries should have official websites allowing you to search and find the nearest retailer. There are two types of lottery tickets: a scratch off or by guessing a certain amount of numbers. A scratch-off ticket, as the name implies, is a card you scratch off. Depending on the game you’re playing, it can be as simple as matching the numbers/pictures to playing a game of bingo. These scratch-off tickets usually have much smaller prizes, but some scratch-off tickets may have prizes that can reach a million dollars or so. Playing the lottery by numbers, often via the Powerball or Mega Millions, provides you the chance to guess the numbers that will be picked that day. If you pick all of the numbers, you will win the jackpot, which is often in the tens or even hundreds of millions. Even if you don’t pick all of the numbers, prizes are still available. For example, with the Powerball, if you were to pick all five white balls in any order, you will win $1,000,000. You can also win by matching at least three balls or even the red ball only. The odds of winning any prize with the Powerball is 1 in 25 chances, while the odds of winning the Powerball jackpot is 1 in 292.2 million, according to NBC News. The Mega Millions, on the other hand, also allows you to choose six numbers, but five must be 1 to 75, while one number should be in the 1 to 15 range. Some states may have a simple pick three or four game, where you have to guess the three or four numbers correctly. The Powerball will be drawn every Wednesday and Saturday night at 10:59 p.m. Eastern Time, when five white balls will be drawn out of a drum filled with 69 balls, along with one red ball from a drum with 26 red balls. If you want to play the lottery without spending as much money, you could join or form a lottery club. This is usually a small group of friends who rotate paying for the lottery tickets with the understanding that any money won will be split evenly among everyone. In most states, you need to be at least 18 years old to purchase a lotto ticket.